Electric field and plasma density instrumentation on board a sounding rocket launched from Punta Lobos, Peru, detected intense electrostatic waves indicative of plasma instabilities in the daytime equatorial electrojet. Simultaneous measurements taken by the Jicamarca radar showed strong 3-m type 1 electrojet echoes as well as evidence of kilometer scale horizontally propagating waves. The in situ electric field wave spectra displayed three markedly different height regions within the unstable layer: (1) a two-stream region on the topside between 103 and 111 km where the electron current was considered to be strongest, (2) a gradient drift region between 90 and 106.5 km where the upward directed, zero-order electron density gradient was unstable, and (3) an “interaction” region between 103 and 106.5 km where both of these instabilities were linearly unstable. The unstable altitudes and differentiation showed good agreement with the simultaneous 3-m Jicamarca backscatter radar observations. In the region where the density gradient was unstable, large-amplitude waves with large scale sizes (wavelengths of roughly 1–2 km) were observed. These kilometer scale waves dominated the observed in situ spectrum despite the fact that the peak in the linear gradient drift growth rate occurred at wavelengths of only a few hundred meters. Comparisons of the measured δE and δn/n components of the large-scale waves verify the basic process inherent to the gradient drift instability: density enhancements were observed coincident with westward electric fields, and density depletions were associated with eastward fields. The amplitudes (10–15 mV/m) of these horizontal waves were strong enough to drive vertical two-stream secondary waves. In the region where these waves existed and the electrojet current was strongest, evidence of wave steepening was seen, and the resulting waveforms of the large structures displayed a “flat-topped” nature. In the lower region of the electrojet the irregularity power occurred over a broad range of wavelengths, estimated to be in the range of tens of meters to kilometers, and fell off rapidly for the shorter wavelengths. Throughout the gradient drift region, shorter-scale waves often occurred in bursts which appeared controlled by the larger electric field structures. 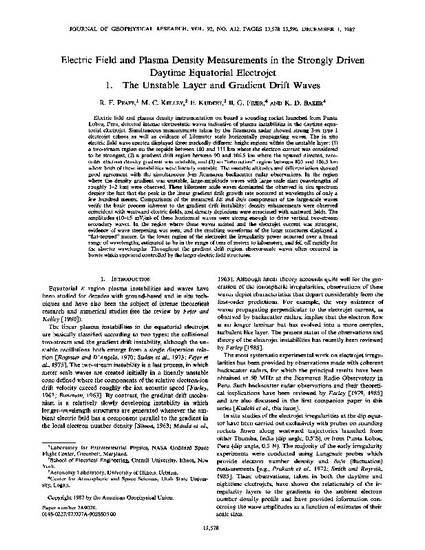 Pfaff, R. F., M. C. Kelley, E. Kudeki, B. G. Fejer, and K. D. Baker, Electric field and plasma density measurements in the strongly-driven daytime equatorial electrojet: 1. The unstable layer and gradient drift waves, J. Geophys. Res., 92, 13578, 1987.